I haven't gotten much further on my thigh-high stripes. That's okay because I needed to work on a Little Oak sweater for this adorable little guy. It's only as overdue as his one year pictures were. 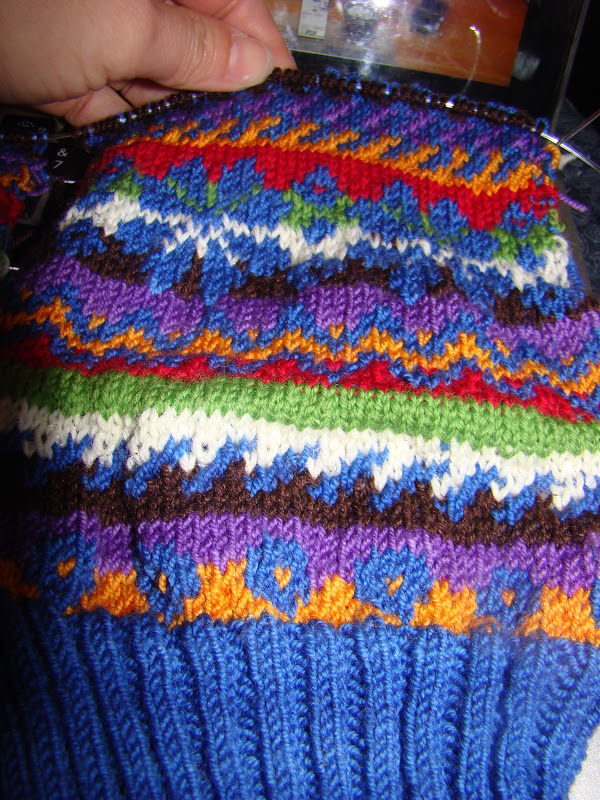 I've gotten a lot done on it in the little amount of time I've had to knit. I'm at the sleeves, which I absolutely hate knitting. I'm glad they're not the last thing I knit on this project. I can't wait to get to the pattern at the top. Hopefully, I'll have time to finish it this week. I am using Ella Rae Lace Merino, which is my absolute favorite yarn to knit with. I'm using it extensively in my socks. I also plan to make Xavier a pair of TARDIS socks out of it. I just started reading Christina Dodd's "That Scandalous Evening." I am a big fan of historical romance, especially from the regency period. This one has been on my shelf long enough that I don't remember it. I love it when that happens.